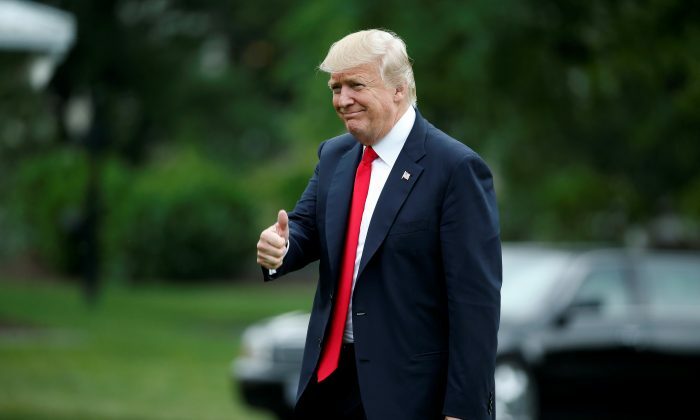 President Donald Trump’s approval rating reached 50% for the first time since late April, according to a poll released by Rasmussen on Friday, June 16. Trump’s approval peaked at 59% in late January. 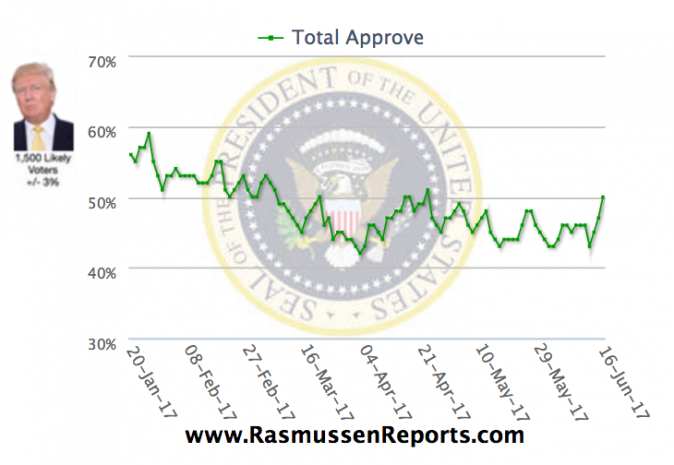 The lowest approval rating Rasmussen reported was at 42% in late April. The president tweeted a celebratory photo shortly after the poll was released. The latest data from Rasmussen shows that 32% of the responders strongly approve of Trump’s performance. With the unemployment rate dropping to its lowest level in 10 years, Rasmussen also found that 61% of Americans are confident in the economy’s fairness. This is up from 42% when the same question was last asked in October last year. A large portion of the respondents in a poll released two days ago on June 14, including 66% of Republican voters, thought that James Comey should be punished for leaking memos to the New York Times. Meanwhile, most voters believe that Congress should investigate whether former Attorney General Loretta Lynch interfered in last year’s FBI investigation of Hillary Clinton. The information on Comey’s leaks and Lynch’s interference were both part of Comey’s testimony before the senate intelligence committee. The poll also found that most Americans think that “politics is to blame for this week’s shooting attack on Republican members of Congress and aren’t writing it off as just random violence.” The shooter in that incident was identified as James T. Hodgkinson, an ardent supporter of liberal causes with a documented history of violence. He was killed in a gun battle with police on the scene. Meanwhile, only 28% linked politics with the shooting of Democratic Congresswoman Gabrielle Giffords and the killing of six others in Arizona in January 2011.